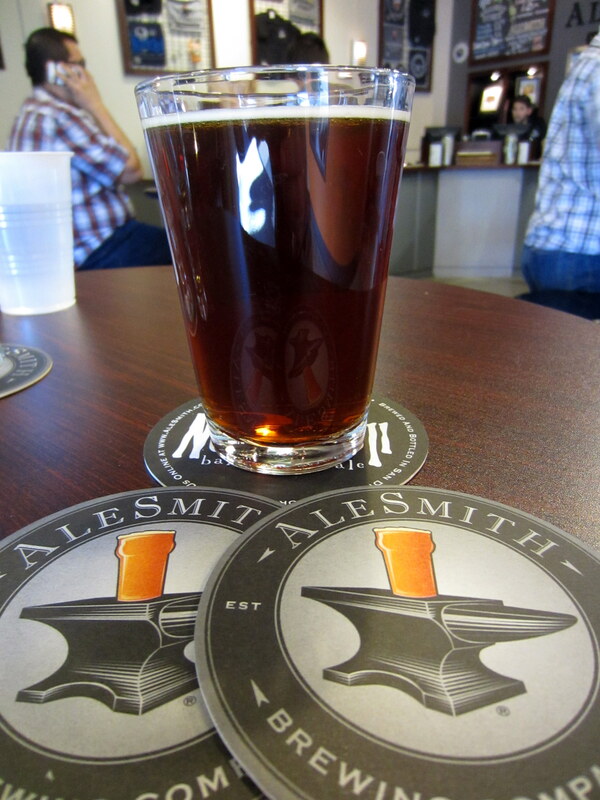 Every year to mark their anniversary Alesmith releases a special beer they call Decadence, and each year the style of the beer is different. Recently (March 2014) I was fortunate enough to visit their brewery in north San Diego, and try the latest incarnation on tap, Decadence 2013, a German Doppelbock. The color is a dark brown color, clear if you look closely, that lets golden-orange highlights through. There is a lot of caramel and butterscotch on the nose, with hints of dark fruit. The taste is rich and decadent, as the name would imply. I’m assuming this is barrel aged because caramel/butterscotch is the focal point here, with some dark fruit in the background, and hints of vanilla. The alcohol warms a little going down but is impressively well hidden for the 10% abv. This beer has a wonderful, velvety smooth mouthfeel. I’d have to say this is the best Doppelbock I’ve come across, though it is a style I only visit occasionally. The barrel aging steers the beer more toward caramel flavors and vanilla highlights than the rich dark fruit character of a traditional German Doppelbock. Depending on your taste preferences you may not care for that detour. It’s so rich that a half-pint was just the right size serving, because it started to get a little sweet by the end of the glass, as Doppelbocks are prone to do. If you like rich, barrel aged, malty beers and you see a bottle of this don’t hesitate to buy it. Unfortunately, I have a feeling that is not likely, they were all sold out of bottles at the brewery when I was there and next year Decadence will be a different beer.